The Tybee Island Light Station and Museum is located near the Savannah River entrance, toward the Northeast end of Tybee Island. The light station is one of only 7 surviving colonial-era lighthouse towers, an iconic structure made of brick, rock, and lumber that was first established here in 1736. 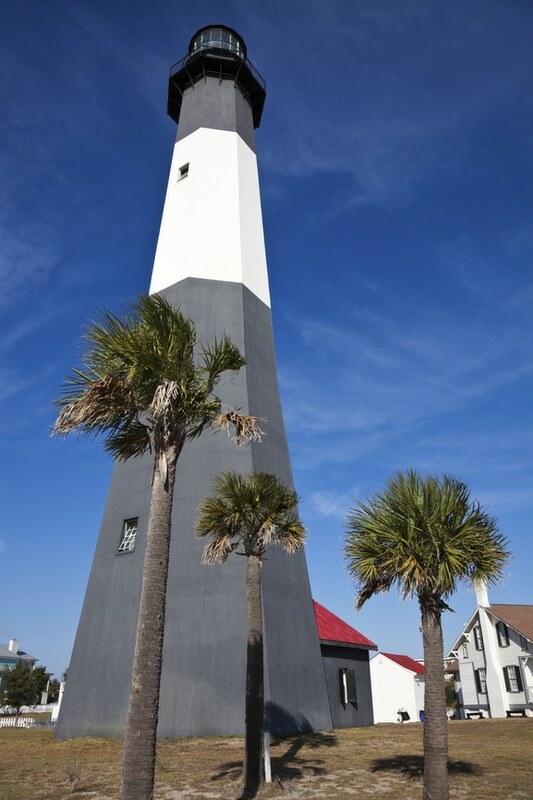 The tower itself sits at 144', making it not only one of Georgia's oldest lighthouses, but also one of Georgia's tallest! The light station guided mariners safely into the Savannah River for close to 300 years, and a tour of it will fill you in on this fact and many more like it. Across the street, you will find an 1899 Military Battery and Tybee Island Museum, for further educational and historical insight. Exhibits inside the museum cover topics such as the Euchee Tribe, the history of Fort Steven, and Tybee's Golden Era in general. There are also 3 cottages on site, one of them, the yellow raised one, the perfect example of 1900s Tybee Island architecture, if you have time to explore it! You can also visit/see Fort Screven, Battery Brumby, and Battery Garland.